Bitcoin’s unrelenting march is not only making Wall Street sit up and take notice — it’s now earning some grudging admiration as well. This is in stark contrast to how Dimon felt about the cryptocurrency just four months ago. Not only had he called it a fraud, he’d also said that he’d fire any JP Morgan employee who traded in bitcoin. “I’d fire them in a second. For two reasons: It’s against our rules, and they’re stupid. And both are dangerous,” he’d then said. Dimon’s comments had sent shock-waves around the crypto world, and bitcoin had tumbled 11% in the following days. Things have dramatically changed since then. Since Dimon’s infamous tirade, bitcoin has risen an astonishing 400% in a matter of four months. The day following Dimon’s comments, bitcoin traded at $3800; today it trades at over $14,000. Briefly, bitcoin had even nudged $20,000 levels before cooling off. And it’s not only bitcoin’s price rise that seems to have softened Dimon’s stance on bitcoin. In December, Bitcoin futures began trading on Cboe Futures Exchange, bring some sort of legitimacy to the previously untamed crypto-currency, and also allowing speculators to easily bet for or against its moves. There have been other moves too — Goldman Sachs, JP Morgan’s longtime rival, is setting up a bitcoin trading desk. Dimon clearly was unsettled by bitcoin’s rise — there’s no easier way to look foolish than have your predictions blow up in your face in a matter of months — but some of his initial concerns about bitcoin are still valid. Bitcoin still hasn’t managed to become mainstream as a currency — transactions can take hours to execute, and the associated fees means that bitcoin’s infeasible for transferring small amounts. Bitcoins also takes up an ungodly amount of energy to power each transaction — each bitcoin transaction takes up enough energy as could power a home for nine days. And bitcoin is still being clamped down upon by world governments — India recently said that bitcoin exchanges had no legal validity in the country, and South Korea is looking to ban trades altogether. 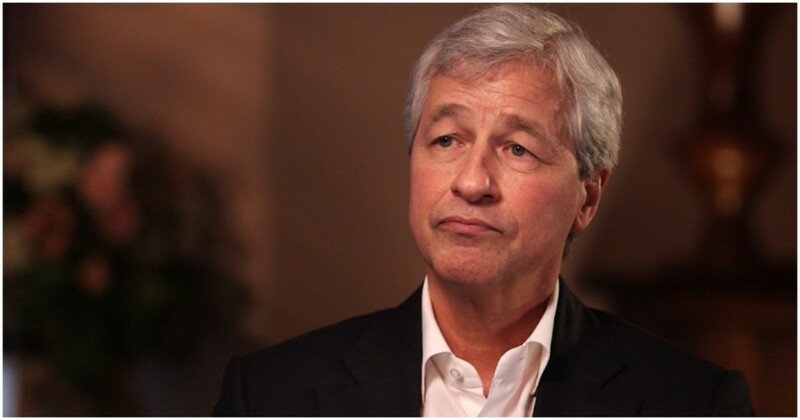 But as long as bitcoin’s price is going up, it looks like Jamie Dimon will be holed up in the safety of Camp Bitcoin.